Fast Food Calorie Counter for Android | Android Blast! Trying to reconcile your diet with your love for fast food? With this handy guide on your mobile, you can keep your diet on track when you have to eat on the run! Nutritional information including calories, fat, carbs, fiber, and protein. 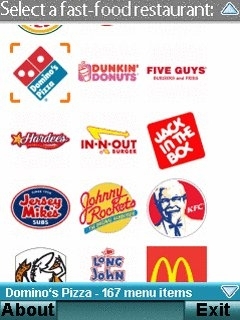 72 of the top fast food restaurants. Arby's, Boston Market, Burger King, Chevy's, Dairy Queen, Denny's, Domino's Pizza, Dunkin' Donuts, Hardee's, In-N-Out Burger, Jack in the Box, KFC, Long John Silver's, McDonald's, Old Country Buffet, Papa John's, Pizza Hut, Popeyes, Sonic, Starbucks, Subway, Taco Bell, Wendy's, White Castle, and many more!